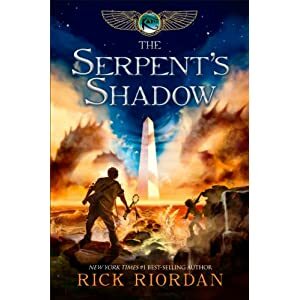 Hyperion Book CH The Serpent's Shadow by Rick Riordan | Free eBooks Download - EBOOKEE! Posted on 2012-05-01, by readalot. He's b-a-a-ack! Despite their best efforts, Carter and Sade Kane can't seem to keep Apophis, the chaos snake, down. Now Apophis is threatening to plunge the world into eternal darkness, and the Kanes are faced with the impossible task of having to destroy him once and for all. Unfortunately, the magicians of the House of Life are on the brink of civil war, the gods are divided, and the young initiates of Brooklyn House stand almost alone against the forces of chaos. The Kanes' only hope is an ancient spell that might turn the serpent's own shadow into a weapon, but the magic has been lost for a millennia. To find the answer they need, the Kanes must rely on the murderous ghost of a powerful magician who might be able to lead them to the serpent's shadow . . . or might lead them to their deaths in the depths of the underworld. Nothing less than the mortal world is at stake when the Kane family fulfills its destiny in this thrilling conclusion to the Kane Chronicles. No comments for "The Serpent's Shadow".